In this Oct. 19, 2003 file photo, Travis, an escaped chimpanzee, is coaxed into a waiting sport utility vehicle in downtown Stamford, Conn. The 175-pound (80-kilogram) chimpanzee kept as a pet was shot and killed by a police officer Monday, Feb. 16, 2009 after it attacked a woman visiting its owners' home, leaving her with serious facial injuries, authorities said. You won’t find Travis the chimp in any pet cemetery. The former celebrity chimp that went berserk and mauled the friend of its owner last week has been cremated. Police shot and killed the 200-pound chimpanzee last week after he brutally attacked Charla Nash, 55. Eileen Donofrio, office manager of All Pets Crematory in Stamford, said Travis was cremated Wednesday morning. Nash was critically injured Feb. 16. Her friend, Sandra Herold, of Stamford, had asked Nash to come over to help lure Travis back into her house. 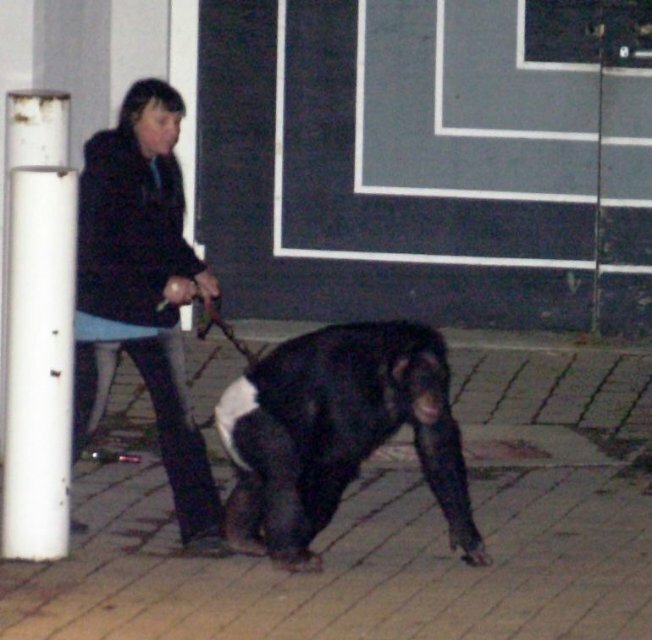 Herold has said the chimp might have attacked to protect her. Nash is being treated at the Cleveland Clinic in Ohio, the medical facility known for performing the first face transplant. Police have not said if they will file charges against Herold.